Yellowstone. The world’s first national park, created in 1872, and to this day the benchmark for the national park concept. The impetus for the park’s creation was largely found in its dramatic physical features: geysers, hot springs, waterfalls, glacial valleys, and mountain peaks. Early reports from the area were so fanciful that they were assumed to be the product of the drunken imaginations of mountain men too long without human company, and no one in Washington believed them until photographs and an official survey confirmed that the whole area is indeed as spectacular as the descriptions made it out to be. That was all it took for President Grant to OK the creation of the park. It’s no wonder the physical features here defy belief. 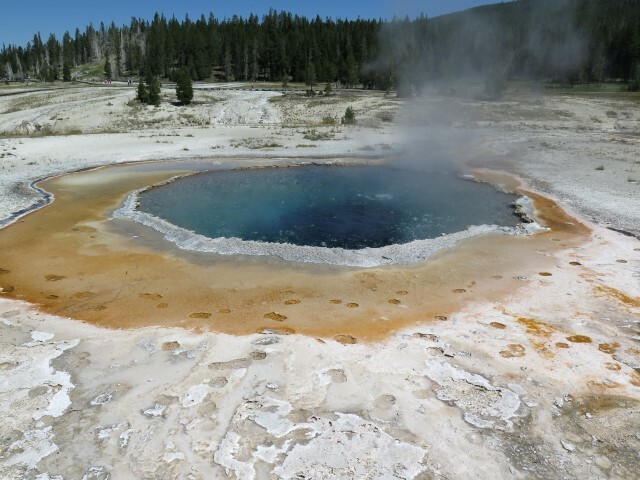 The Yellowstone area is the product of a series of explosions of the “Yellowstone Supervolcano,” a category defined as a volcano whose eruptions eject more that 250 cubic miles of volcanic debris. 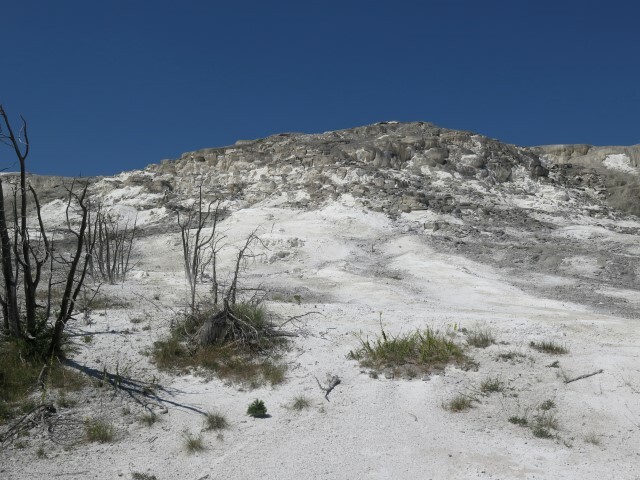 (That’s “cubic miles,” like with with “m.”) The Yellowstone volcano has had at least three such eruptions: 2.1 million years ago, 1.2 million years ago, and 640,000 years ago, that ejected 6,000, 700 and 2,500 times more stuff than the eruption of Mt. St. Helens. (If you’re a typical overprotective parent, add this to your list of daily worries: eruptions occur about every 600,000 years and the last one was 640,000 years ago.) The last eruption was so powerful it blew lava and ash into Louisiana! If it were to blow again, about two-thirds of the United States would be affected. Seriously. This is one big honkin’ volcano. And each time it erupts, it shifts and collapses in on itself leaving a landscape, including the famous geothermal features, that only a Martian could invent. We were first here on our pre-marital honeymoon (how’s that for a concept?) 44 years ago, and have returned several times since then, so the question is how many times can we return before the effect of those “dramatic features” wears off? 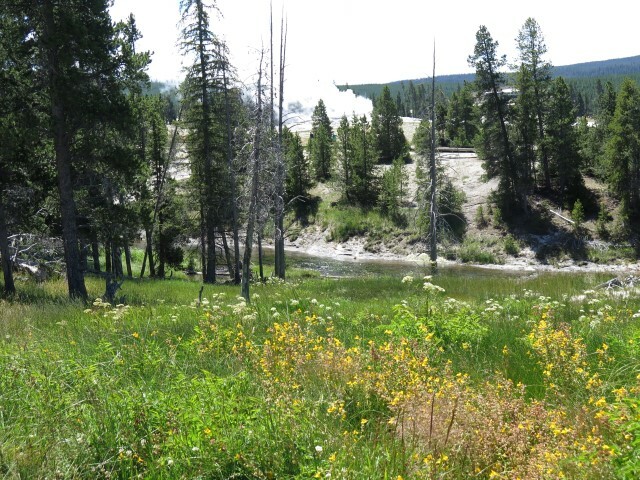 Wendy’s view is that the real impact of most of the sights in Yellowstone happens on the first visit, and successive visits add little to the experience. My own view is a little different. 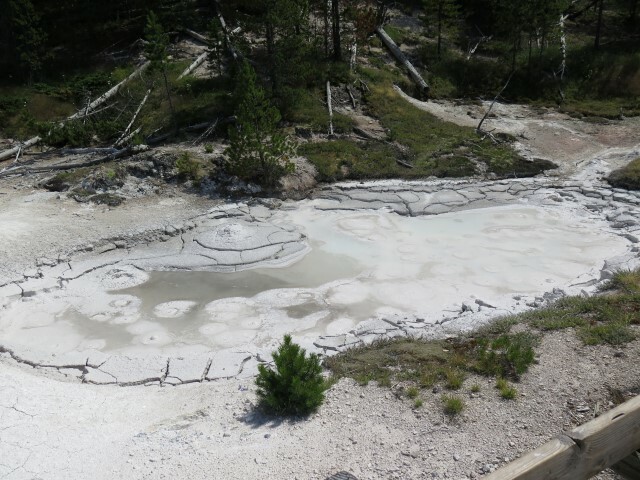 For me, the effect doesn’t wear off so much as it, “matures.” Either way, though, there’s so much to see and do that both of us agree it would take many visits before one has really “done” Yellowstone. 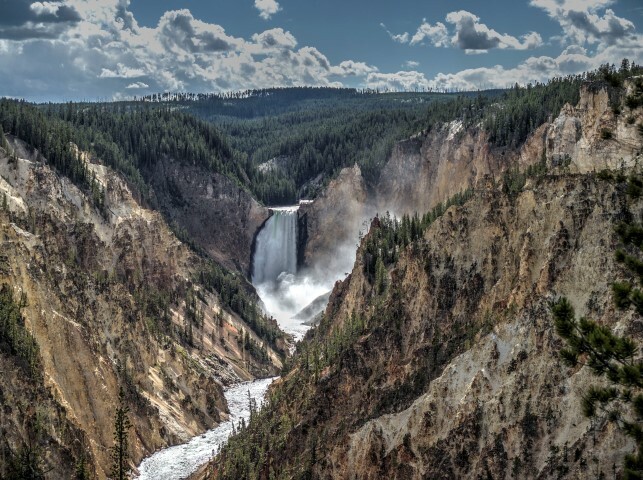 On the day we arrived, for example, we made a quick jaunt up the road to the nearby Grand Canyon of the Yellowstone to see the upper and lower falls, things we’ve seen numerous times before, and once again were taken with the beauty of this place. Lower Falls, as seen from Artists Point, a view that has been photographed and painted at least a billion times, not including a couple hundred million selfies taken by Asian tourists and American millennials while we were there. And no, this is not a painting I copied from the internet; it’s a photograph taken at the scene. So, we spent the next two days simply driving around the park. The main roads in Yellowstone form figure-eight shape, just right for a couple days of motoring around, seeing the sights. Of course, “driving around” means experiencing waits for bull-headed locals who amble along the roadway oblivious to the delays they create. Some people worry that humans have an adverse effect on the wildlife. Ha. The wildlife either don’t care about humans or take a perverse pleasure in annoying us. Either way, don’t worry about the animals. 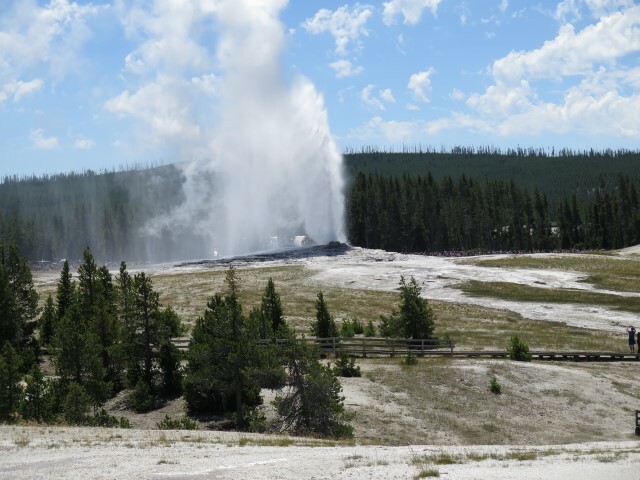 Old Faithful, as seen from the back, whatever that means. Grand Geyser, the largest geyser in the world, spewing boiling water about 75 feet high, and it goes on and on until, frankly, we got bored of watching it and went elsewhere. One of many belching mud thingies. The “geothermal” features of Yellowstone aren’t beautiful, and it’s hard to see the glory of God’s creation in a sulfurous nauseating cauldron that belongs in the third circle of hell, but these features are so unspeakably weird that we actually enjoy traveling around just looking at them. Mammoth Hot Springs. Except (too bad for the huge Mammoth Hot Springs Hotel), the springs aren’t. The flow of water went dormant in 1998 and so now it’s just a big white terraced rock, and those striking multi-colored pools of water are all gone. If the springs remain dormant, this will be just a big pile of dirt. Hard to imagine the “Mammoth Pile of Dirt Hotel” holding much appeal for tourists. Asians maybe. 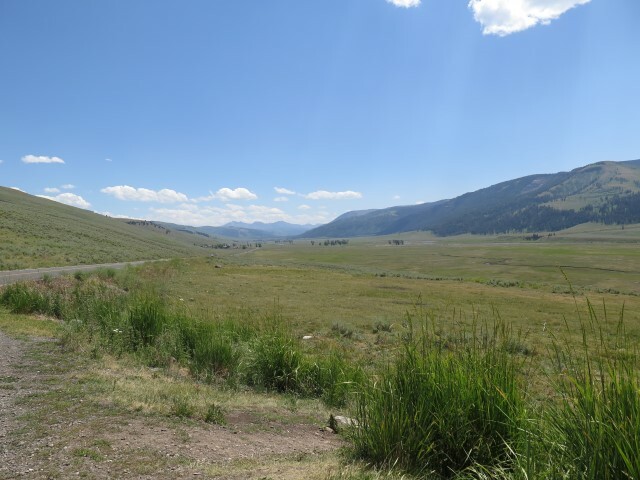 The Lamar Valley in the very northeast section of Yellowstone. For some reason, we’ve never been here in all of our trips and it’s both beautiful and unlike anything else in the park. Definitely coming back here to explore further. First, we were here in 1988, the year of the worst fires ever at any national park. Those fires destroyed one-third of the park. However, since much of the park is grassland or river canyons, the fraction of the forest land destroyed was much higher. Everywhere one goes, there are miles and miles of burnt forests, even now with only minimal regrowth. 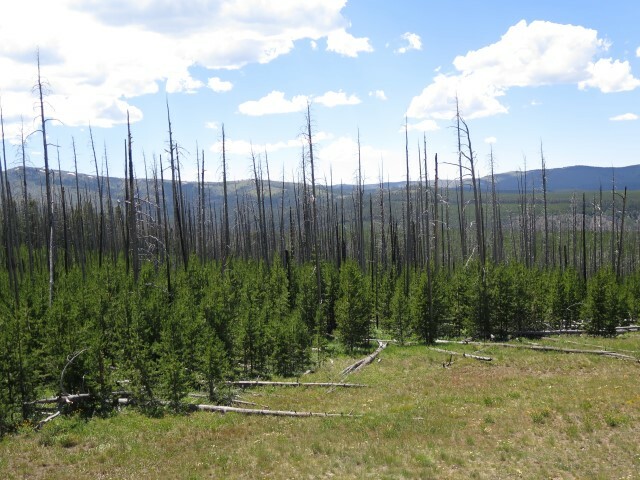 One of the burned areas, with new lodgepole pines only four to eight feet high. In other more favorable areas, the lodgepoles are up to 25 feet high. In some areas, regeneration is barely visible, leaving a landscape of miles of fallen burned logs, even 28 years after the fire. This is near Mt. Washburn, a rocky terrain that seems to defy regrowth. Those are all fallen logs that cover the hillside. In all of this, though, the National Park Service makes a good point. 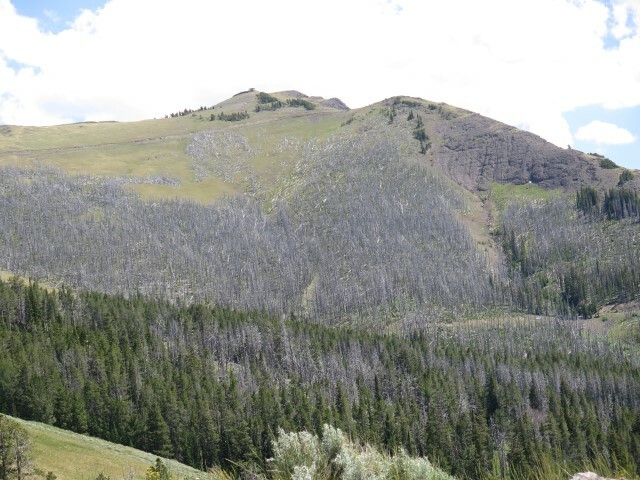 Fire is a natural part of the landscape and lodgepole pine might take 200 to 300 years to reach maturity. So the cycle of death and regeneration that occurs regularly here is much longer than a human lifespan. But in terms of the age of the park, the cycle is a blink of an eye that has occurred millions of times in the past and will continue to do so. Still, it’s sobering to think that no one will see the park as we saw it in 1972 until maybe the mid-2300’s. Second, it is impossible to discuss Yellowstone without discussing the crowds. In 1916, the National Park Service was created with this objective: “… to conserve the scenery and the natural and historic objects and the wild life therein and to provide for the enjoyment of the same in such manner and by such means as will leave them unimpaired for the enjoyment of future generations.” The tension is obvious: to provide for the enjoyment of the National Parks by the people of this country, while leaving them “unimpaired” for future generations. As we’ve been traveling around visiting National Parks during this busy travel season, we have often thought about the issues inherent in balancing these potentially conflicting objectives. This is especially true at Yellowstone. 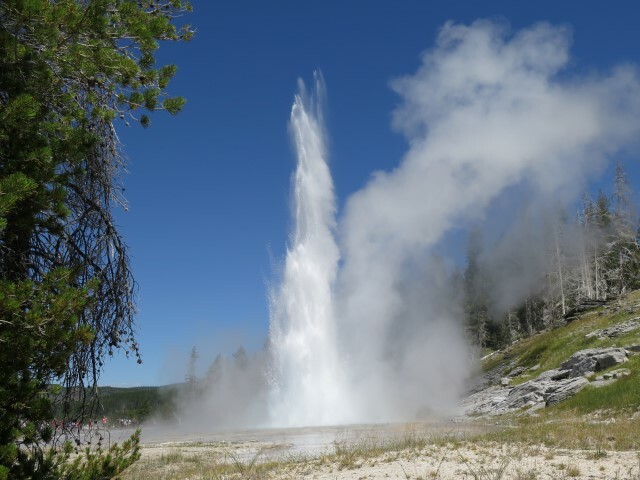 According to rvtravel.com, last year more than four million people from all over the world visited Yellowstone, most in the peak summer months of July and August. The park superintendent was quoted in the May issue of National Geographic as fearing that the number of visitors would have to be limited or there would be irreparable damage to the park’s resources. So, what to do about the crowds? The National Park Service is considering all its options, but there aren’t many good choices. Access by the people is not only mandated by the NPS organic legislation, it’s critical to the mission to inspiring in people a sense of the majesty and importance of the natural order. For me personally, the greatest problem with the crowds is not the effect on nature but the effect on the crowds. 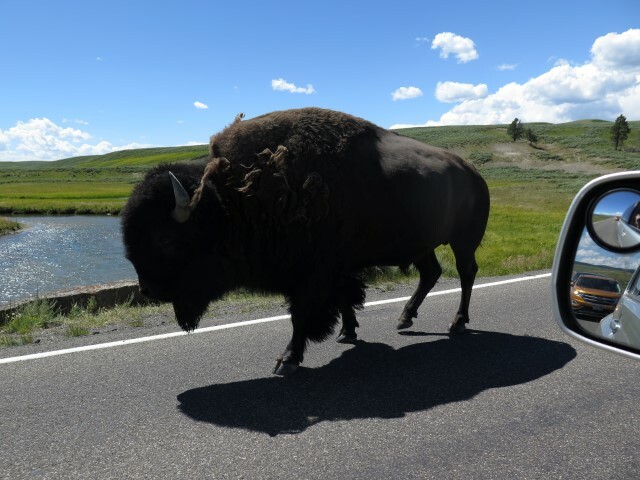 When the density gets too high, even people in Yellowstone start to adopt the behaviors and general decency of New Yorkers. It’s a common experience that urban environments tend to be nasty and transporting those aspects of human nature to a place that’s supposed to be a refuge from such things defeats the purpose of the parks. And, for those waiting for this point, here’s “proof of life” for the dogs. 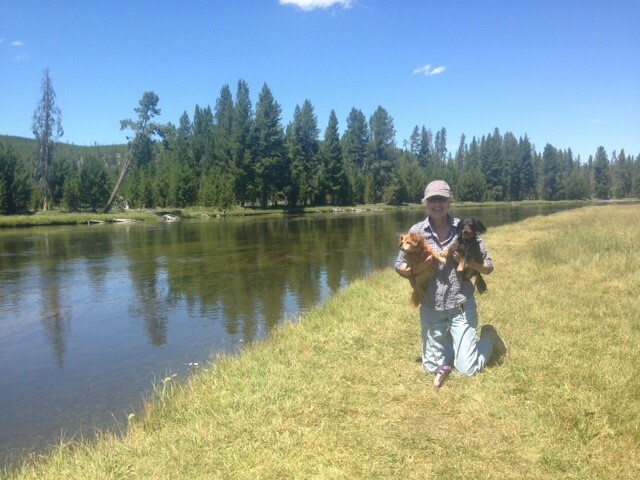 I know this photograph is supposed to have Wendy holding today’s newspaper, but this is Yellowstone. They don’t have newspapers. Good thing, since we couldn’t bear to read one anyway. In any event, the dogs are still alive. For now. And yes, that is an expression of dread you can see in their eyes. Apparently dogs have sufficient contemplative ability to sense an uncertain future. This entry was posted in Deep Thoughts, Travels on July 20, 2016 by skiprd.